Standiford Family: "My nerves are large." This is what Mattey said on the way to her first ever band concert. Mickey and I tried not to laugh out loud because that would have hurt her feelings but we thought it was hilarious. 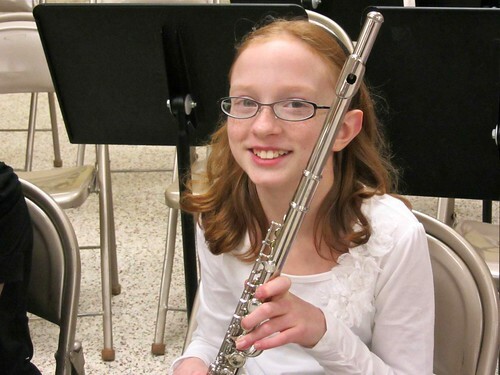 Mattey's first band concert was at her school in the cafeteria of all places. I guess they couldn't get a better place. It was hot and crowded. The kids gave it their all. Mattey did a great job following Mr. H., the band director. She played her little heart out. After the show we stopped at McDonald's for sundaes because that has become the tradition, even if it is 30 degrees outside. We are still having IT problems. The computer seems to pass (black) out and then comes back to life on its own a while later. Mickey now thinks the video card is to blame. I think the iMac is partying too much while we are away. good for the new little flutist! she looks darling in spite of large nerves.